Tá bosca éadaí caillte againn san oifig. Beidh siad ag dul go dtí an siopa dara láimhe tráthnóna amárach, Dé hAoine (28.06.2013) mura bpiocann sibh suas iad. We have a box of lost clothing in the school office. It will be going to the second hand clothes shop tomorrow, Friday (28.06.2013) if the clothes are not claimed. Díreach chun sibh a cur ar an eolas tá athrú tar éis teacht ar na gúnaí scoile i Marks and Spencers. Go dtí seo bhí 3 fhilleadh chun tosaigh ar an gúna. Anois níl seo ar fáil a thuilleadh. Anois táimid ag moladh an ceann le 3 fhilleadh chun tosaigh agus ar cúil. Just to let you know Marks And Spencers have changed their pinafores. Up to now the school chose the one with three pleats at the front. These are no longer available so now we are going to go with the pinafore with 3 pleats to the front and 3 pleats to the back. Beidh ranganna 1,2,3&4 ag críochnú ag 12.15. 1st, 2nd, 3rd, and 4th classes will finish at 12.15. The Catholic Church is celebrating the ‘Year of Faith’ from October 11th 2013 to November 24th 2013. God opens the door of faith for each of us (Acts 14-27). The Year of Faith is an opportunity for every Catholic to rediscover their spiritual path. That we might draw strength from the Faith of our Fathers, the Kinsale Pastoral Area, which is the parishes of Courceys, Clontead and Kinsale, together with the Carmelite Friary are organizing a Mass at the Carmelite Mass Rock in Ceathru, in the parish of Clontead on Friday, 12th July at 7.30pm. Everyone is welcome. In the event of bad weather, the Mass will be celebrated in the Carmelite Friary Church. From the Fire Station in Kinsale take the R607 road to the Half Way, travel 6.8km, then take a left turn onto the L7223, go 1.2km, turning right at ‘T’ junction and the entrance to the Mass Rock is on your right hand side. Ar mhiste libh €2 a thabhairt isteach dó chomh luath is féidir? Please could you bring in €2 each to pay for it as soon as you can? Bhí cruinniú Boird Bainistíochta aréir agus phléamar an fhadhb plódú páirceála sa charrchlós agus pairceál na múinteoirí ar an gclós. Tá roinnt tuistí mí-shásta faoin socrú nua páirceála agus tuigim dóibh. An teachtaireacht a theastaíonn uaim cur amach ná go bhfuilimid lán sásta dul thar nais amach ag páirceál lasmuigh chomh luath is atá socrú éigin nua ann chun deileál leis an bplódú gluaisteáin. Táim ag iarraidh ar tuismitheoirí anois smaoineamh ar shlite chun é a fheabhsú. Is féidir ríomhphost a cur chun na scoile ag eolas@gaelscoilchionntsaile.ie má bhíonn aon réiteach agaibh. Cuirfidh mé fáilte roimh smaointí. Níl aon fhadhb agamsa le páistí ag imirt le liathróidí sa chlós ach tá fadhb an-mhór agam le ró-plódú gluaisteáin agus an dainséar a bhaineann leis dos na páistí. Dea-scéal dos na Naíonáin Shóisearacha-bhuaigh siad an cómortas 'Bob-a-job' leis an méad airgid a bhailigh sibh! Maith sibh a pháistí agus go mór mhór na tuismitheoirí a shocraigh an rud go léir chun airgead a bhaliú don scoil. Bhí an-lá ag an scoil inniú - uachtar reoite agus seó puipéad! Mar fhocal scoir ba mhaith linn ár gcomhgháirdeas mór ó chroí a ghabháil le Philippa Nic an Taoisigh ó Rang na Naíonáin Shóisearacha. D'éirigh léi duais a fháil na chomortas ealaíne Aerfort Chorcaí agus tá a grianghraf agus a pictiúr le feiscint san "Southern Star" an tseachtain seo. Fuair an scoil dearbhán le caitheamh in Easons dá bharr! Go raibh maith agat agus chomhgháirdeas arís! There was a Board of Management meeting last night and we discussed the crowded parking problem in the car park and teachers parking in the yard. There are some parents unhappy about the new parking arrangement and I understand their point of view. The message I want to convey is that we are very happy to go back to the parking arrangement outside as soon as there is a new way of dealing with the overcrowded car park situation. I am now asking the parents to think of ways to improve the situation. You can send an email to eolas@gaelscoilchionntsaile.ie if you have any ideas. I will welcome suggestions. I have no problem with children playing with balls in the yard but I have a big problem with over crowding of cars and therefor putting the children at risk. Good news for the Junior Infants - They won the 'Bob-a-job' competition with the amount of money they collected! Well done and especially well done to the parents who organised it all to raise monry for the school. Finally, we would like to give a hearty congratulations to Philippa Nic an Taoisigh in Junior Infants. 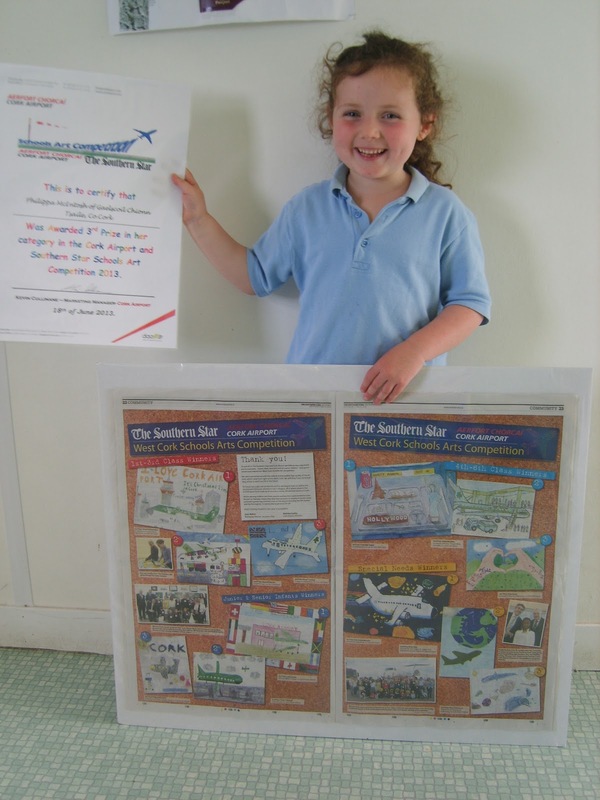 She succeeded in winning a prize in the Cork Airport art competition and her photograph and picture will be on the Southern Star this week. The school got a voucher for Easons as a result! Thank you and congratulations again! Cuireadh ar an eolas mé go raibh cás míoltóga ghruaige i Ranganna 3&4 (Seomra Ranga Siobhán Ní Núanáin). Scrúdaigh gruaig do pháiste anocht agus cuir an leigheas cuí air más gá. Go raibh míle maith agaibh! I have been informed of a case of head lice in 3rd and 4th Class (Siobhán Ní Núnáin's class room). Please check your child's hair tonight and treat it if necessary. Thanking you all in advance! Tá dea-scéal agam do thuismitheoirí rang na Naí Shinsearacha atá ag Múinteoir Eavan faoi láithir agus an leath do rang Michelle a bheidh ag roinnt leo an bhliain seo chugainn! Tá múinteoir álainn nua faighte againn daoibh. Múinteoir Máiréad Ní Scannláin a bheidh ann. Tá sí ag teacht ó Ghaelscoil eile agus táimíd an-tógtha léi. Tá fhios maith agam go noirfidh sí dár Ghaelscoi álainn! Chomh luath is atá na múinteoirí eile faighte againn cuirfear ar an eolas sibh. I have great news for the parents of children in Eavan's class at the moment and the half of Michelle's class that will be sharing with them next year! We have appointed a lovely new teacher for you! Múinteoir Máiréad Ní Scannlain is her name. 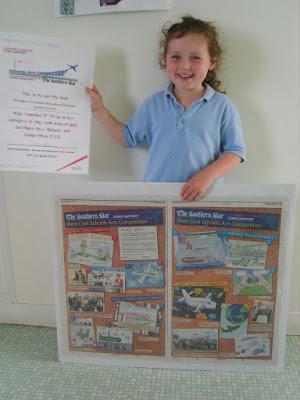 She's coming to us from another Gaelscoil and we're absolutely thrilled with her. I know she's going to fit in so well and suit our great Gaelscoil! As soon as I have any news about the other vacancies in the school I will let you know. Chuaigh na tuairiscí scoile amach sna málaí scoile inniú. Theastaigh uaim míniú ghairid a thabhairt ar an BIAP. Belfield Infant Assessment Profile. Féachann an BIAP ar gach gné do dhul chun chinn do pháiste agus an aidhm atá ann ná laigeachtaí a aimsiú. Tá miniú air thíos. Súil agam go bhfuil an BIAP níos soléire daoibh anois. The school reports went home today in the children's school bags. I wanted to give a brief explanation on what a BIAP is. Belfield Infant Assessment Profile. The BIAP looks at specific aspects of your child's progress and aims to identify weaknesses in those areas. There are 4 sections. 1. Perceptual processes - Child's auditory and visual perception -his ability to receive and make sense of information coming through hearing and vision. 2. Motor Development -Child's physical or motor co-ordination as manifested in his/her large (gross) or small (fine) body movements. 3. Early Learning styles -Evaluating the child's typical ways of approaching learning tasks or his/her characteristic responses to the learning situation. 4. Language and Communication -Child's understanding of the spoken word, the clarity of their speech, the extensiveness of their vocabulary and the accuracy of their sentence structure. The tasks are carried out over a number of days and the results tallied. I gave your child's actual score and the average score for their age. We will use the children's profiles to identify weaknesses (if any) and strengths in order to continue to provide your child with the most suitable education to cater to their specific needs. I hope this gives more clarity on the BIAP. Beidh blitz tag rugbaí ag R3 & R4 amárach, Déardaoin an 20ú Meitheamh 2013. Caithfidh na leanaí ar fad éide spóirt a chaitheamh. Is féidir leo brístí gearra a thabhairt leo chomh maith le buataisí peile más mian leo. Bí cinnte go mbeidh uachtar gréine orthu agus péire stocaí sa bhreis má tá sé fliuch. 3rd and 4th Class are having a Rugby Blitz tomorrow, Thursday 20th June 2013. All the children must wear their sports clothes. They can also bring shorts and football boots if they wish. Make sure they have sun cream and a spare pair of socks if it is wet. Tar ar scoil ag an gnáth am, bailigh do pháiste ag a 3.30 ón scoil. Beidh lón á fháil againn i Funky Town mar sin níl gá ach snack beag a thabhairt dod pháiste agus rud amháin milis. Tá foirm ceadúnais i mála scoile do pháiste inniú. Seol thar nais é sínithe amárach led' thoil. Beidh aistriú éadaí agus bróga, túaille, culaith snámha agus cóta báistí ag teaisteáil ó gach leanbh. Come to school at the usual time. Collect your child at 3.30p.m. We will be getting lunch at Funky Town so you need only bring a small snack and one sweet thing for your child. There is a consent form in your child's school bag this evening which has to be signed and handed in to Hilda in the morning before the bus leaves. Every child will need a change of clothes and shoes, a towel, swimming togs and a raincoat. Fé mar is eol daoibh, tá an turas scoile eagraithe againn d'amárach an 18ú Meitheamh 2013. Beidh rang do linbh ag dul go Feirm Uí Laoithe. Bíodh do leanbh ar scoil ag a 8.30 mar beidh an bus ag fágaint ag a 8.50 ar an spota! Táimid ag súil le bheith thar nais ar scoil ag a 1.30 nó beagán níos déanaí. Bíodh an éide spóirt agus uachtar gréine á chaitheamh ag do leanbh. Bíodh back pack le lón mór acu – tá dhá rud milis ceadaithe! Níl cead acu airgead a thabhairt leo. Má bhíonn aon eolas breise nó leigheas a bheidh ag teastáil uainn tar chugainn le bhur dtola roimh an turas. As you know, we have a school tour organised for tomorrow 18th June 2013. Your child's class will be going to Leahy's Farm. Have your child at school at 8.30 because the bus will be leaving at 8.50 on the dot! We are hoping to be back at school at 1.30 or a little bit later. Your child should wear the school sports clothes and sun cream. Give them a back pack (not a wheely bag as there's a gravel path) with a big lunch – there are two sweet things allowed! They are not allowed to bring money with them. If there is any extra information or medication that we need, come to us before the trip please. Cuirfear ar an eolas sibh chomh luath is a bheidh na múinteoirí nua socairte. Lé cúnamh Dé, beidh siad socraithe i rith an tSamhraidh ach níl aon chomhlacht againn ar maoil an bpainéal. You will be informed as soon as the new teachers are decided upon. Hopefully, they will be organised during the summer but we have no control over the delays in the panel. Alternatively if you use Facebook or Twitter, you can also receive the school news by clicking ‘like’ on the school Facebook page or by ‘following’ the school on Twitter. Please just make sure you first read and understand the School Facebook policy located at Polasaithe na Scoile / School Policies. There have been large outbreaks of measles in Ireland and Europe in the past year. These outbreaks have occurred because many children have not received the recommended two doses of MMR vaccine. The first MMR vaccine is given to babies at 12 months of age. Children receive the second dose at 4-5 years of age. This is usually given at school by the HSE's school immunisation team in Junior Infants or some children may have gone to their GP. The HSE is offering a dose of MMR vaccine to all primary school children who have not completed (or are not sure they have completed) their two dose MMR vaccination schedule to protect them from measles, mumps and rubella. This vaccination will be offered in HSE Clinics over the summer 2013. If you wish to organise an MMR vaccination in a HSE Clinic please phone or email your local Immunisation Service (details above) between Monday 10th June 2013 and Friday 21st June 2013 only.You will receive an appointment date to attend for vaccination if required. Telephones will be manned from 9 am to 12 Midday, Monday to Friday. Written consent for immunisation will be obtained at the HSE Clinic. A parent/legal guardian is required to attend to sign consent. Please note these clinics will operate for a limited time period only and enquiries will not be accepted outside of the above times. Tá sé i gceist ag na múinteoirí ranga na codanna mothálacha a chlúdach seachtain an 17ú Meitheamh 2013. The class teachers propose to cover the sensitive subjects on the week commencing 17th June 2013. Is oth linn le rá go bhfuiar seanmháthair le hAlma bás maidin inniu. Ar dheis Dé go raibh a hanam dílis. Táimid go léir ag smaoineamh ar Alma agus a chlann ag an t-am deacair seo. Ní bheidh aon ranganna pianó ar siúl an tseachtain seo. We are sorry to say that Alma's grandmother died this morning. May she rest in peace. We are all thinking of Alma and her family at this difficult time. There will not be any piano classes this week. Mar is eol daoibh níl an scoil ag ceannach na leabhair scoile níos mó (seachas do rang na naíonáin shóisearacha). Beidh na leabhair liostaí á chur ar an suíomh againn amárach. Tá an siopa leabhair, Liam Ruiséal, ag oscailt siopa sa scoil ar an Déardaoin bheag seo, an 13ú Mheitheamh 2013, óna 5 - 7p.m. Tá fáilte romhaibh na leabhair a cheannach uatha agus bheith socraithe roimh an bhriseadh. Gan amhras, is suas chughaibh fhéin atá sé. As you know, the school isn't buying schoolbooks any more (except for the Junior Infants class). We will be putting the book lists on the school website tomorrow. Liam Russell's Bookshop is opening a shop in the school this Thursday, 13th June 2013, from 5 to 7p.m. You are welcome come and buy the books from them and be organised before the Summer. Of course, it is up to yourselves. Tá orainn íoc as an turas scoile Funkytown roimh-ré. Mar sin an bhféadfadh sibh an t-airgead a sheoladh isteach roimh an gCéadaoin an 12ú led' thoil. Má tá daoine nach bhfuil ag freastal ar an dturas an bhféadfadh sibh sinn a cur ar an eolas ionas go mbeidh uimhreacha cruinn againn don dturas agus don mbus. Bíodh deireadh seachtain deas agaibh faoin ngriain! We have to pay for the Funkytown outing in advance. Therefore could you send in the money before Wednesday the 12th June 2013, please. If there are people who aren't going on the trip can you let us know so that we will have exact numbers for the activities and for the bus. Have a lovely weekend in the sun! Bhí roinnt daoine ag lorg go rachaimís go O.E.C. Kinsale Chionn tSáile arís i mbliana ach ní féidir mar nach féidir leo glacadh le grúpa chomh mór ar aon lá amháin. D'fhreastalaíomar air anuirigh agus seans go nusáidfimid arís é. Is athrú atá i gceist anseo. There were a few people asking to go to the O.E.C. Kinsale again this year but we can't because they can't take a group as big as this in one day. We went there last year and we may go there again. We decided on a change this year. Gearradh siar ar an obair bhaile!/ Cut back on homework! Toisc an aimsir álainn táimid chun gearradh siar ar an obair bhaile go mór don gcéad cúpla lá eile/ don tseachtain. Tá súil agam go mbainnfidh sibh go léir taitneamh as an dea-aimsir! Because of the beautiful weather we are going to cut back a lot on homework for the next few days/ for the week. I hope you will all enjoy the fine weather! Beidh ceolchoirm veidhlín ar siúl ar scoil ar an gCéadaoin an 19ú Meitheamh 2013 ag 9.30 a.m. Tá cuireadh ag tuismitheoirí na páistí ag seinnt teacht chuige. There will be a violin concert at school on Wednesday 19th June 2013. Parents of children who are playing are invited to attend. Lá Spórt bliantiúil ar scoil. Tá súil againn go raibh deireadh seachtaine álainn agaibh agus go raibh deis agaibh taitneamh a bhaint as an aimsir bhreá. Beidh an lá spórt bliantiúil againn ar scoil amárach 05.06.2013 ! Mar sin bíodh éadaí spóirt agus uachtar gréine ar gach duine! Ní dhéanfaidh sé aon díobháil hata a bheith á caitheamh acu chomh maith más féidir. Beidhmíd ag bailiú airgead ar son Down Syndrome Ireland, mar sin tabhair €2 isteach chun uachtar reoite deas a fháil. We hope you had a lovely weekend and you got a chance to enjoy the fine weather. We will have the annual sports day at school tomorrow, 05.06.2013 ! So everyone should wear sports clothes have suncream on! It wouldn't be any harm for them to wear some kind of sun hat / cap if possible too. We will be collecting money for Down Syndrome Ireland so bring in €2 and get delicious ice cream.